I'm still playing with the new products from Lil' Inker Designs' latest release. You can view all of the new products here if you'd like. This card was really simple to make. 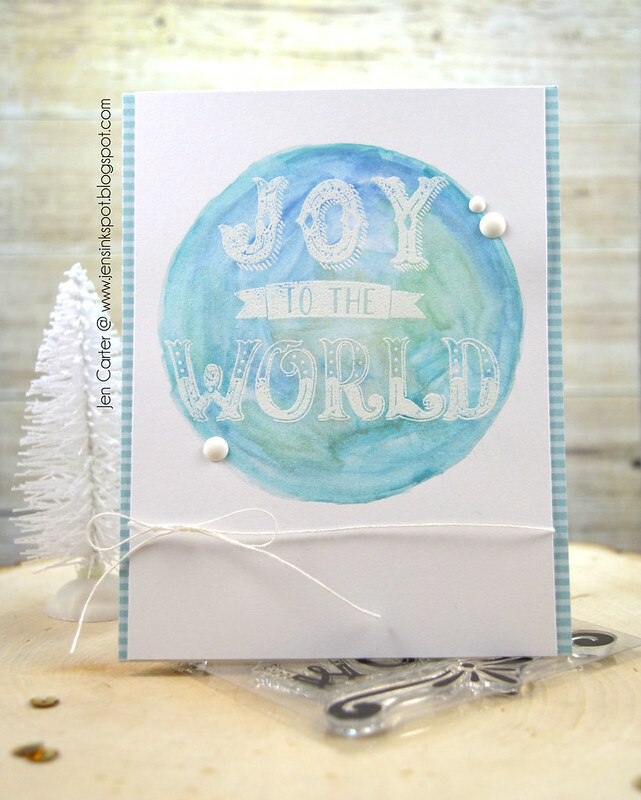 I started by stamping the new Joy to the World stamp and embossing it in white. I then used some cheap shimmer watercolor cakes (found here) and painted a circle around the sentiment in blues. I added a little green randomly. When it was dry I tied some white twine around the panel and attached it to the blue & white striped paper. Super simple & easy to mass produce! It's the time for Fall candy and candy corn has made appearances in stores. We're just under a week away from Halloween and I thought it was an appropriate time to share this candy corn shaker card I made. The candy corn is die cut with the Giant Candy Corn die by Frantic Stamper. I backed each section with the corresponding cardstock color and turned it into a shaker, adding sequins. The sentiment is die cut with the Elegant Thankful die. I stamped the paper with the Grunge Crosshatch Background stamp to add some texture. The yellow frame was die cut with one of the Pinprick Rectangle dies. Hello. :) I wanted to play with this camera paper from the Shimelle Glitter Girl line. I love camera images and what's better than a rainbow of cameras? 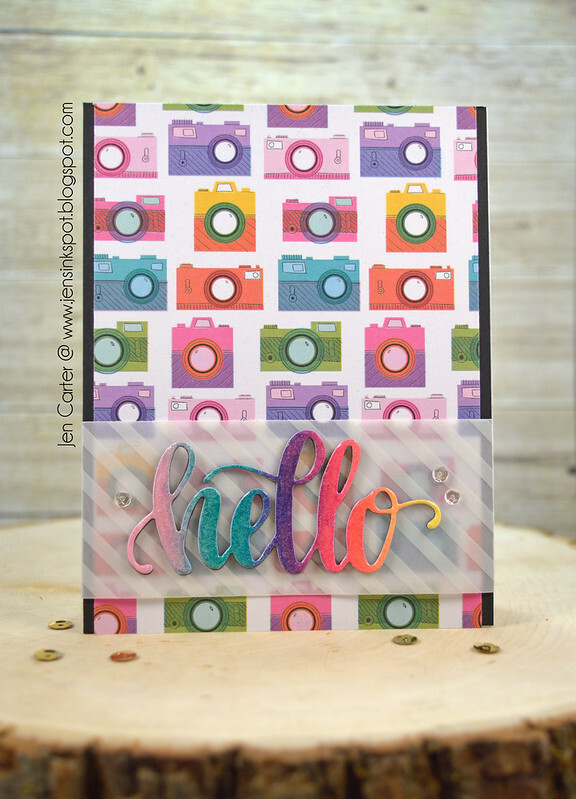 I used the gorgeous Catherine Pooler inks blended on Bristol Smooth cardstock to create that gorgeous hello, die cut with the Hello die. (Do you have the Hello die yet? Love the handwritten "font" and the size!) The colors I used to create the rainbow are It's a Girl, Aquatini, Flirty Fuchsia, Party Dress, Orange Twist & Tiara inks from Catherine Pooler. I die cut the hello two more times and then adhered all three layers together to create dimension. I adhered it to a piece of striped vellum and added some sequins. I'm glad you stopped by today! Have a wonderful day! 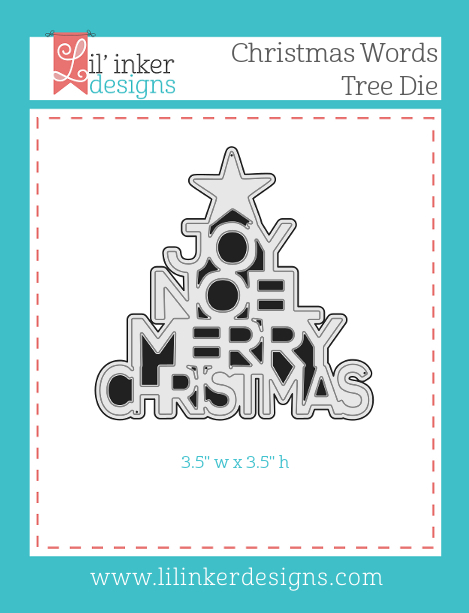 This card focuses on a fun new die called Christmas Words Tree die. I die cut it out with a copper gold paper and then paper pieced the gold glittery star & Christmas on top. I also die cut some stars from the previously released Starry Sky die to add to the sky. The border was die cut with the Stitched Mats: Dual Stitched Rectangles dies. If you love to color this next stamp set is for you! I die cut the Vintage Christmas Wreath and then stamped the wreath with the Vintage Christmas Wreath stamp set. I embossed it in gold and then colored it with Zig Real Brush Markers. For the center, I used one of the Stitched Mats Circles dies to cut a circle from Kraft. The sentiment is stamped and embossed and is also from the Vintage Christmas Wreath stamp set. 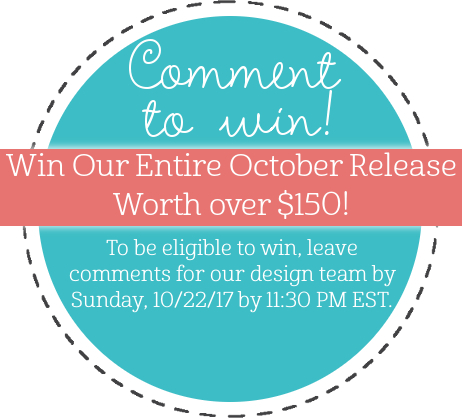 Be sure to comment on all of the Design Team blogs so you are eligible to win the entire October release from Lil' Inker Designs! Thank you for joining me this week for the newest Lil' Inker Designs release! Welcome to day 2 of the Lil' Inker Designs Release! All of the products being shown today are currently available in the Lil' Inker Designs store! Today I have 2 Christmas themed cards to share using the new Rowdy Reindeer Stamps & Dies, Joy to the World Stamps & the Festive Florals Stamps. 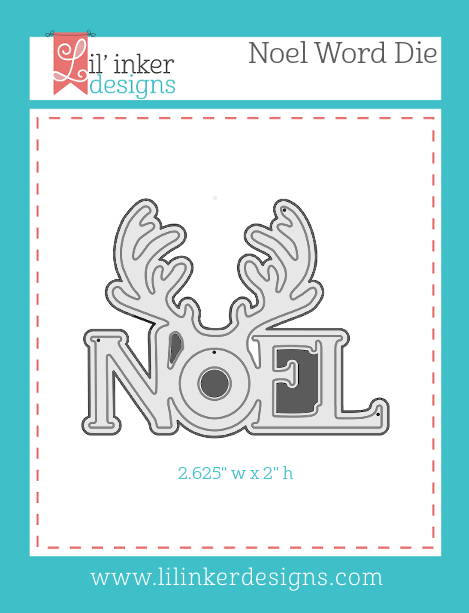 If you like Lil' Inker Designs sassy stamps, you'll love the new Rowdy Reindeer Stamps & Dies! 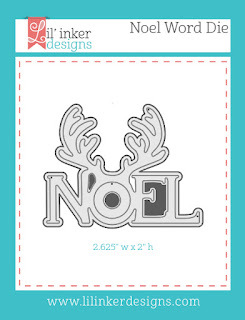 I die cut the reindeer with the Rowdy Reindeer die and the stamped him with the Rowdy Reindeer Stamps. I colored him with copics and added a sequin for his nose. The background was die cut with the Cover Up Die: Diamond Chevron and I backed it with a black & white patterned paper. I stamped the sentiment on the Pinking Edge Sentiment Flag die cut. I wanted to make it look like the reindeer was flying so I die cut & stamped some trees from the Rustic Christmas Stamp & Die set. I stamped the present from the Party Pachyderm stamp set and fussy cut it out. 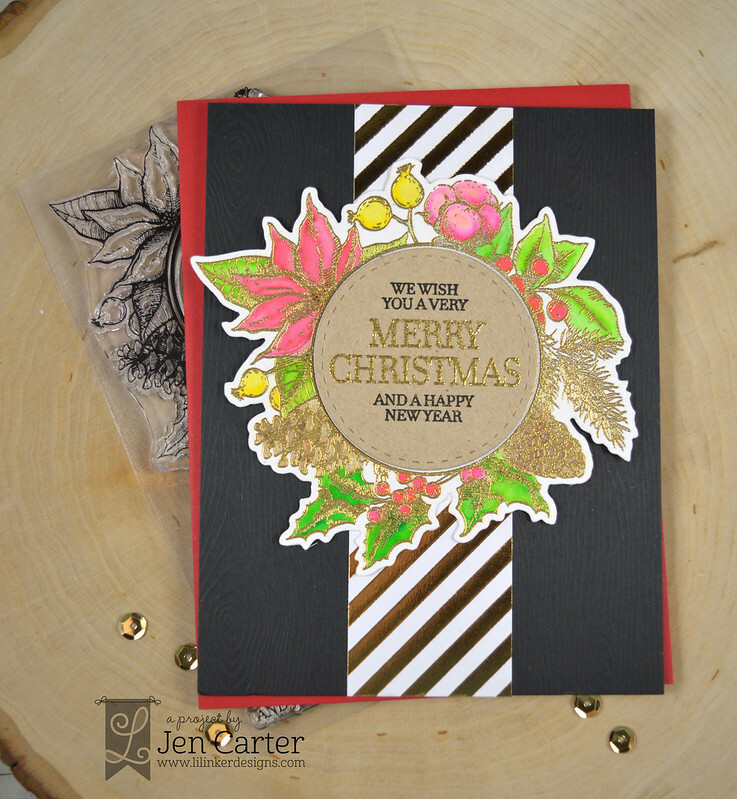 I love black & white backgrounds on card and I felt like the Festive Florals Stamps would work nicely to achieve that look. I started by stamping the background on white cardstock with the Festive Florals Stamps (there are coordinating dies too!). Then I carefully, carefully cut apart my Joy to the World Stamp so each line would be an individual stamp (you could do this same technique and just mask off the part of the stamp that you don't want inked up at the time too). I embossed each line in a different color on to black cardstock. Then, I popped the pieces up with dimensional tape and added a few enamel dots. I also wanted a pop of color on the inside of the card so instead of my normal white card base I used an aqua color. This card has a "twin" of sorts that I'll share at a later date. You can shop all of the new products now by clicking here. To shop for all of the new products click here. Be sure to comment on all of the Design Team blogs so you are eligible to win the entire release from Lil' Inker Designs this month! Hello and welcome to the October Lil' Inker Designs release! The new products are already available in the Lil' Inker Designs store so you can start shopping now! I have THREE cards to share today! I know, it's a lot but I hope you'll scroll all the way to the bottom. If you follow my blog you know that I like non-traditional Christmas cards (does this even qualify for a Christmas card? Not sure.) I used the gorgeous new Cover Up Die: Geometric Snow which ranks right up there with my favorite cover up plate ever. I think it's great for a floral look too! I sponged Distress Oxides inks on a white piece of cardstock in an ombre pattern and then diecut. For the panel, I die cut one of the Wonky Squares Dies out of white cardstock. I then stamped the ampersand from the All About Ampersand Stamp Set in the middle in a light gray ink. I stamped the fun & cool new Peace, Love & Joy Stamps in various colors and embossed them with a clear glitter embossing powder. I love the little shine and sparkle the embossing powder gave the letters. This next stamp set was fun to work with! I stamped the Season's Greetings Stamps on watercolor paper and put the little dog inside of the frame (there are 3 animals to choose from!). I used Zig Real Brush Markers to color the frame, dog and banner. The sentiment is also included in the stamp set. I fussy cut the entire thing out. I added stitched detail to the edge of the card with the Silly Stitched Die set. This card is my husband's favorite card that I made for this release. 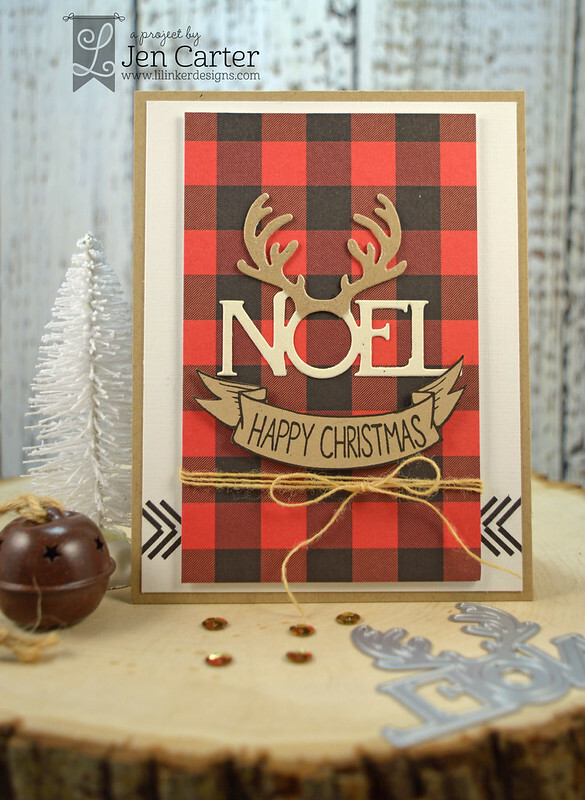 I die cut the Noel Word Die in both kraft & vintage white cardstocks and then pieced the antlers on top of the Noel. I also added glitter with a shimmer pen to the antlers but I couldn't capture it well in a photo. I stamped the banner & sentiment from the Season's Greetings Stamp Set and then fussy cut it out and popped it up with dimensional tape. On the white background I used a border stamp from the Tribal Chic stamp set to peek out from behind the plaid paper. Be sure to comment on my blog for your chance to win the entire October release from Lil' Inker Designs! Today is release day for Catherine Pooler's Stamp of Approval Winterhaven box collection. The collection is now available for those who weren't on the Wait List. But hurry because 70% of the boxes have already sold and the rest will sell out quickly! I have one more project I wanted to share with you today using products in this collection. 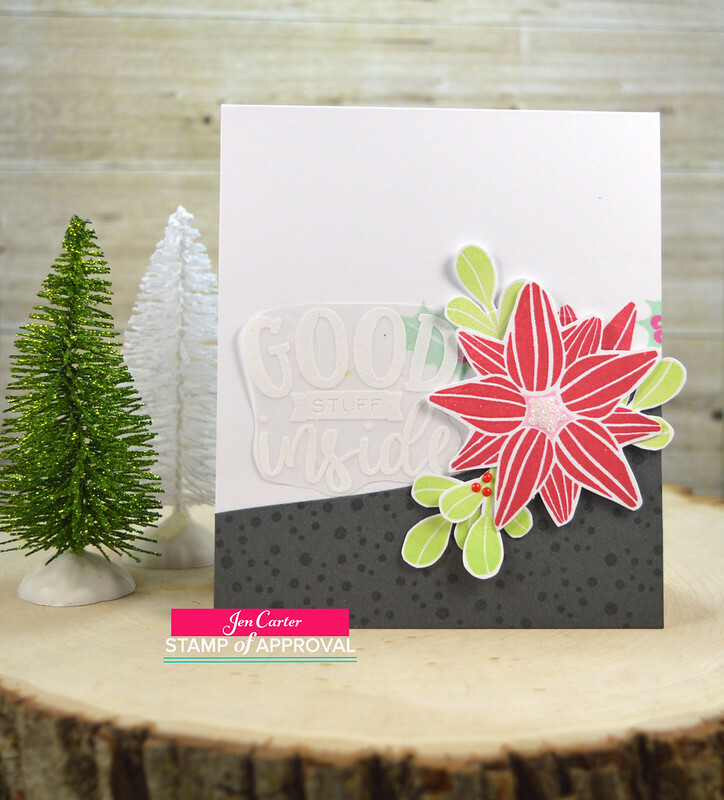 The 'Tis the Season floral stamp set in this collection is a beauty! 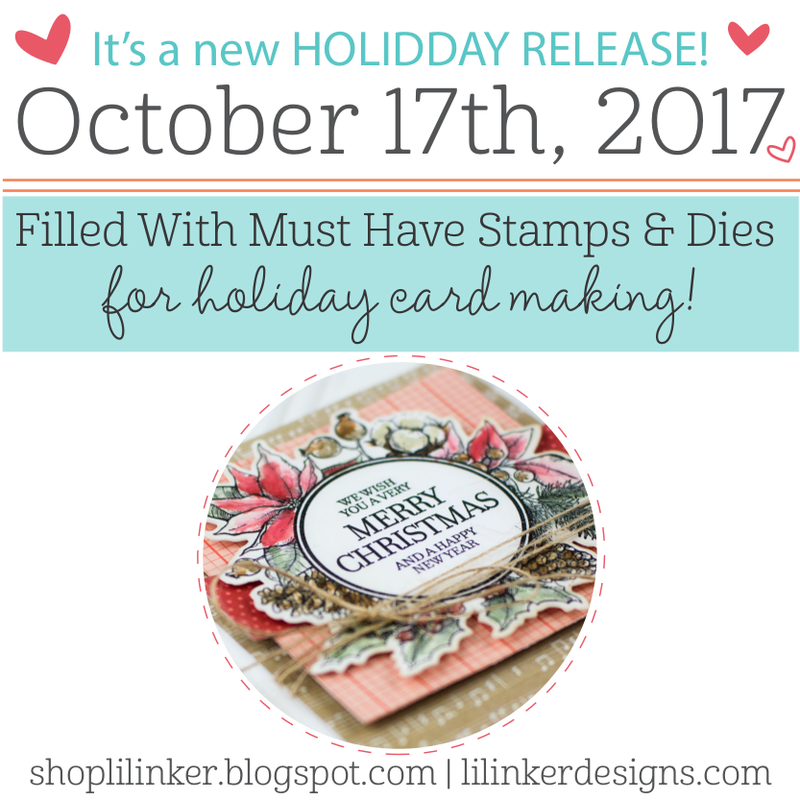 And there are add-on 'Tis the Season dies available in this set (not included in the collection) that coordinate with the stamps that are available now. My card is slightly shorter than a standard A2 card to accommodate a surprise on the inside. I used a card base that was 4 1/4 x 11" and then folded the inside edge up an inch and then scored at the 5" mark (rather than at 5 1/2" like usual). More about why later. I stamped the poinsettia, mistletoe & holly leaves in Rockin' Red, It's a Girl, Garden Party & Mint to Be inks and a few berries in Party Dress ink. I cut out the ones that I wanted to pop up, but you can order the 'Tis the Season add-on dies now if you would like the coordinating dies to match. I added glitter to the center of the poinsettia. The sentiment is such a fun font combination and it is from another stamp set in the collection called Good Stuff. I stamped & embossed it in white on vellum. The gray cardstock, from the Smoke & Mirrors cardstock bundle, was first die cut (the diagonal) using the Winterhaven Die Set and then stamped with the dots in VersaMark ink from the 'Tis the Season stamp set. For the inside you can see how I folded the flap up to hold a gift card. I wanted to be able to frame the gift card and the large label/tag die included in the Good Stuff Die Set made the perfect backdrop for this. I die cut the label shape from red cardstock, stamped the snowflakes from the Good Stuff Stamp Set with VersaMark and the stamped the dots from the 'Tis the Season stamp set around the outside of the label. The "from" is also included in the the Good Stuff Stamp Set and was stamped with Garden Party ink. 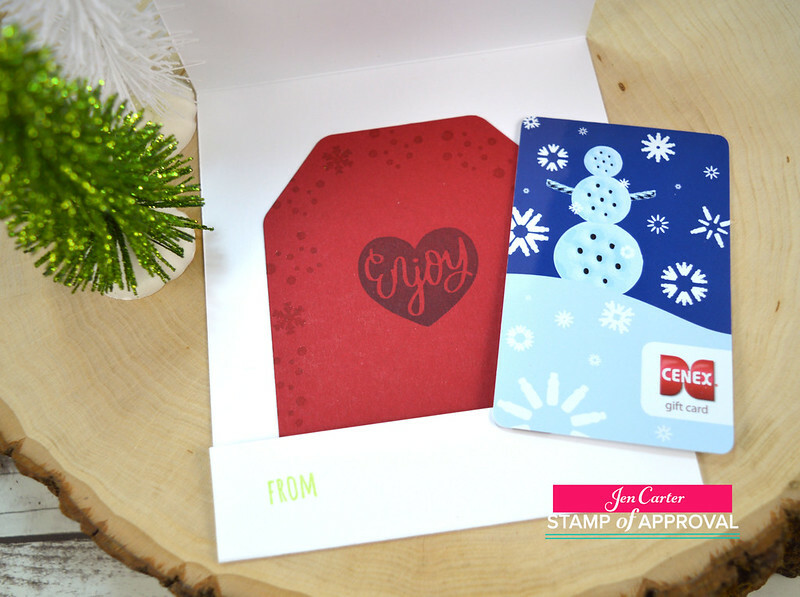 When you remove the gift card you can see the sweet little enjoy that was stamped with Black Jack ink and is also in the the Good Stuff Stamp Set. Thank you for joining me today for release day! 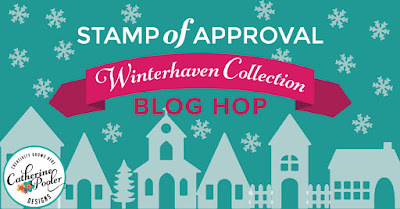 If you haven't already ordered the Winterhaven Stamp of Approval box, you better hurry because they could be sold out soon! I hope you have a wonderful day! 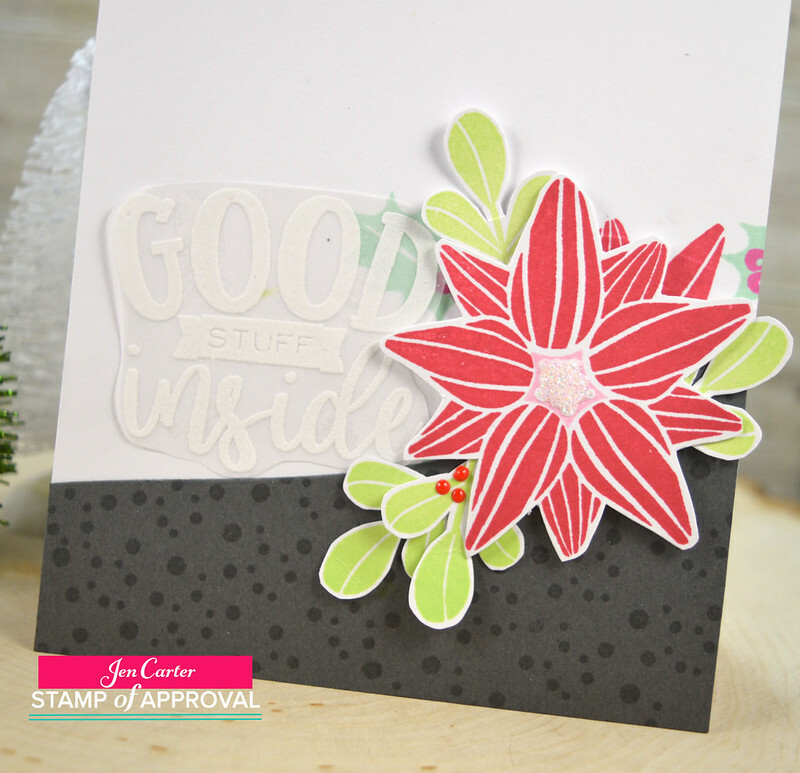 It's Christmas time with a NEW Stamp of Approval Box from Catherine Pooler! Welcome to Day 2 of the blog hop featuring this wonderland of winter goodies! 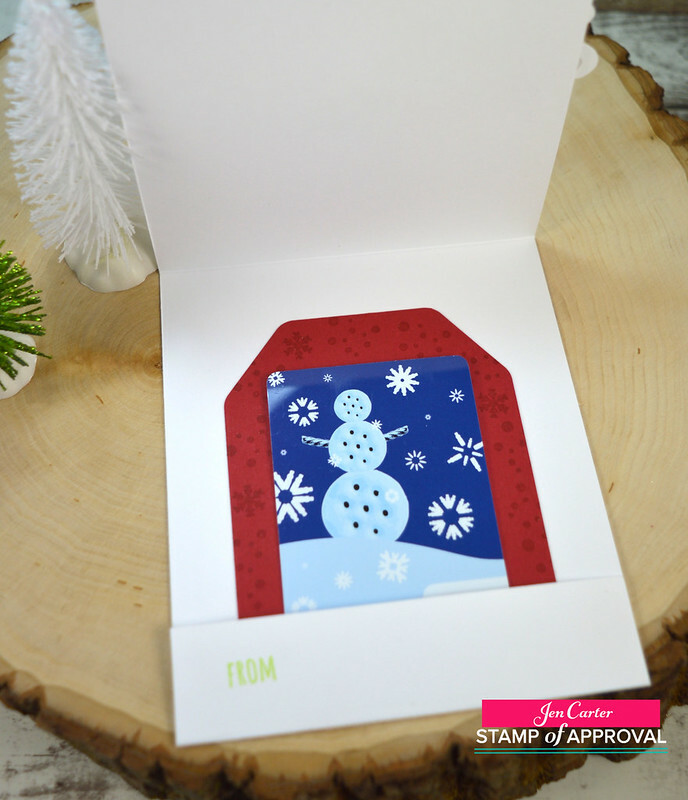 This Stamp of Approval box is called Winterhaven and I found the contents to be very versatile! If you are unsure what the Stamp of Approval Box is, it is a quarterly hand picked, exclusive collection of products that were designed just for the box. The stamps, dies and other fun products in the Stamp of Approval Collection won’t be released for individual sale for several months over at the Catherine Pooler store. Be sure to subscribe to the Wait List so you will be emailed the purchase link when the collection goes on sale on August 16th! These boxes do sell out quickly! And last quarter they sold out in record time! Joy to the World is one of my favorite Christmas carols. I can remember singing it as a child and we sing it to this day along with more modern Christmas worship songs. It captures the Christmas holiday perfectly in a few short stanzas and inspired this clean and simple card. For this card I started with a medium gray cardstock (the new gray cardstock Smoke & Mirrors from Catherine would be a perfect choice!). I scored a line on the right & bottom edges with my score tool. 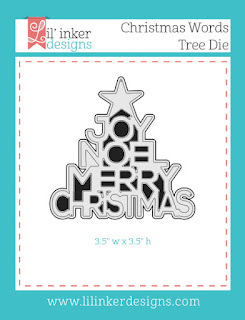 I die cut the Joy Wreath included in the collection out of white cardstock. I die cut the joy from the same die set out of a plum cardstock and stacked three of them on top of each other. 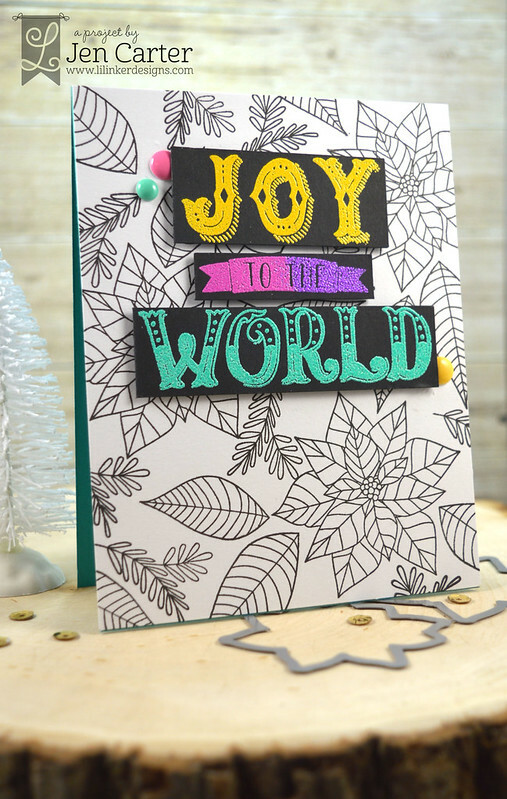 I used the beautiful 'Tis the Season Stamp Set from the collection to stamp the leaves in Mint to Be ink (if you don't have this ink, you need to try it! It's my favorite ink! You can see the entire collection here.). I fussy cut the leaves but there is a add on die collection for this set 'Tis the Season Dies that you can purchase when the release goes live on Tuesday...yippee! For the sentiment I used the Here We Come A-Caroling Stamp Set to stamp the sentiment. I masked off each word and stamped them separately with Black Jack Ink. 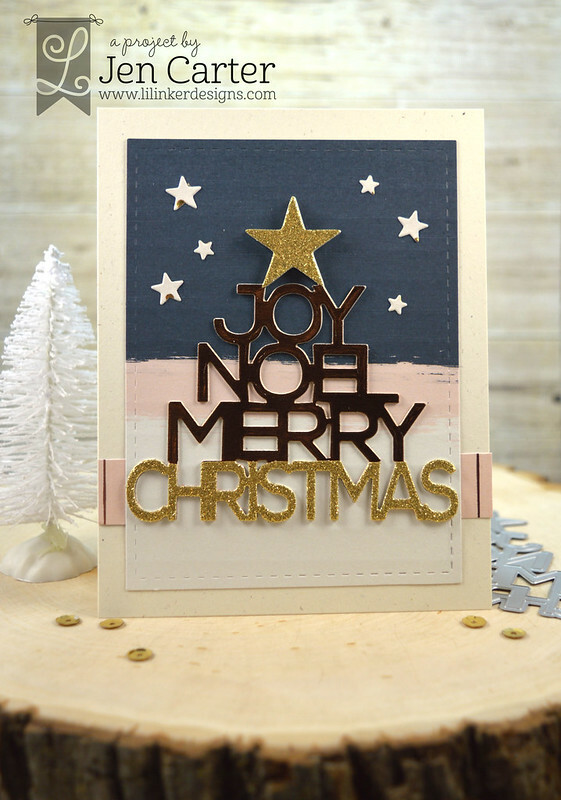 You can also see in this picture that I used a glitter pen (Nuvo) to add some glimmer to the top of the Joy die cut. To continue with the caroling theme this next card uses a line from Silent Night. Silent Night is another favorite Christmas carol, in fact it could by at #1. 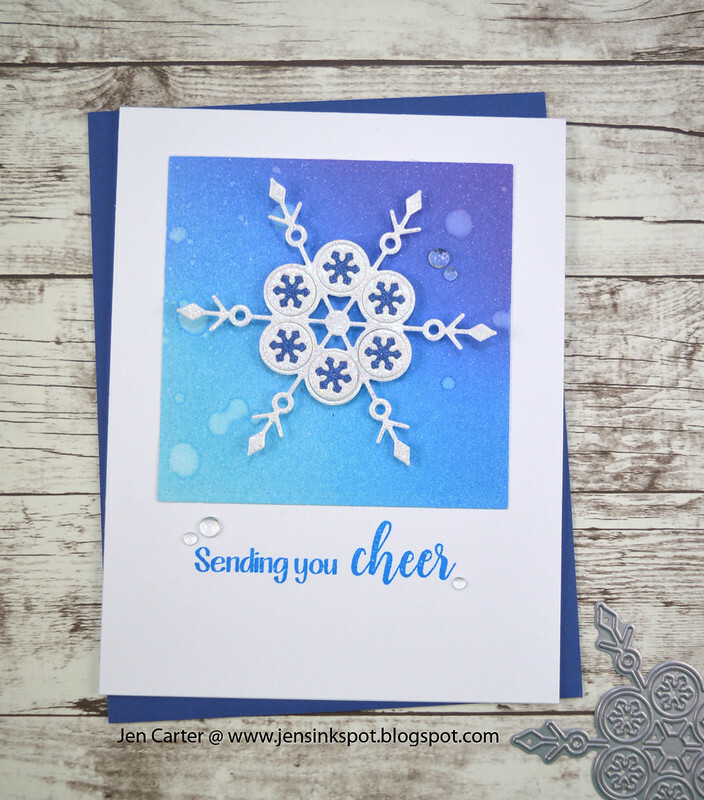 I combined several products included in the Winterhaven collection on this card. I started by creating my sky by blending Fiesta Blue, Something Borrowed, a hint of Pixie Dust & Midnight inks. I then flicked water onto the background to create the splotched stars. I die cut the glittered white snow landscape using and the adorable houses with the Winterhaven die set. 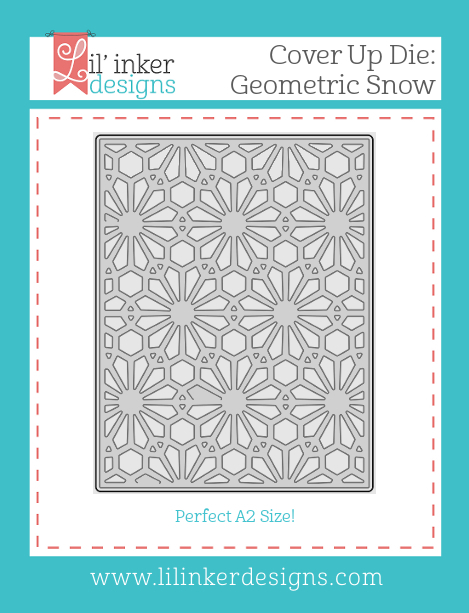 So many fun combinations can be made using this die set (winter or otherwise!). 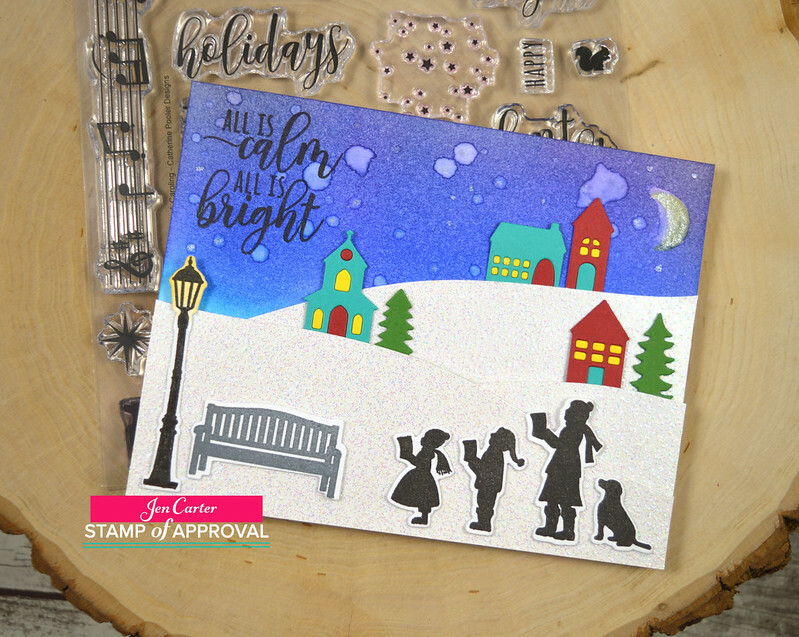 I die cut the light, bench & carolers from the add-on die set called Here We Come A-Caroling die set which will be available in the store at release, and stamped them with the coordinating Here We Come A-Caroling Stamp Set in Black Jack & Midnight ink. I made the light to "glow" by sponging a tad bit of Tiara ink around it. Last, I stamped the moon in Tiara (and added a touch of glimmer from a pen) and the sentiment in Midnight, also from the Here We Come A-Caroling Stamp Set. To see more from this amazing collection, be sure to visit all of the designers who are posting today! Also be sure to visit Catherine's blog tomorrow for more sneak peeks from this collection. And come back here on Tuesday, October 10th at 6PM EST for more projects from me as we celebrate Release Day! Comment to win! One winner will be chosen at random from each day's comments and announced on October 11th on Catherine's blog. 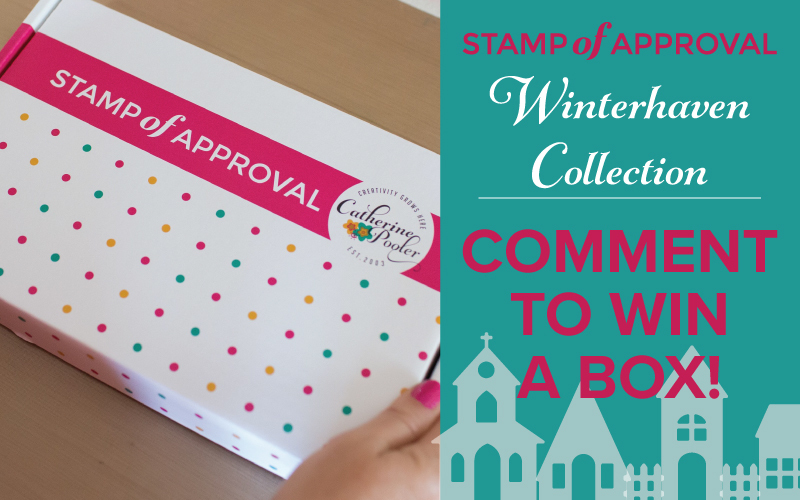 The winners will each win one of the Winterhaven Stamp of Approval boxes and if you already purchased it, you will be issued a Gift Certificate worth $100 towards a future purchase!